... and baby makes three (photo taken early on in my pregnancy). 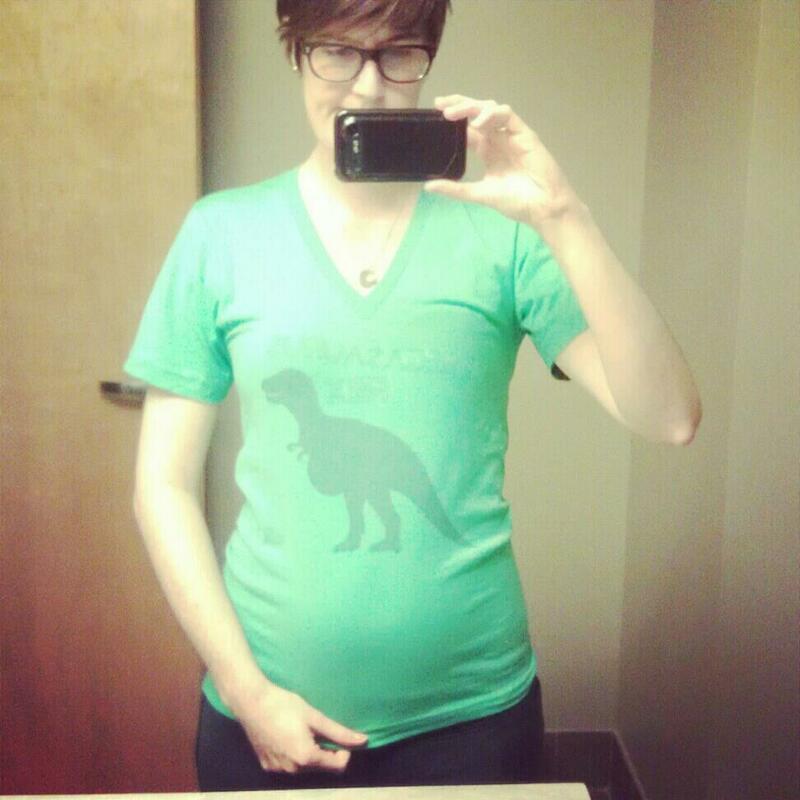 Also, my shirt says "pregosaurus rex." Obviously. To leave my job caring for over 400 college students, of living where I work, of getting a real home, of focusing more on my blog and shop, of taking care of my family more deeply and fully-- a dream come true. And now that it's happening, like actually happening 2 weeks from today, I am a little scared for what this new identity holds. I am a horrible cook, but that's been ok for the past few years because I was always busy anyway, and I had a meal plan so there was always the dining hall. I don't keep a very clean house, but that was ok because our apartment was small and we were often too busy to notice. I'm not real disciplined about getting up in the morning, but that was ok because I had a slew of meetings and students and responsibilities outside the home to get me showered and out the door. I'm used to meeting planning, not meal planning. I'm used to running a facility of 400, not a house of 3. But now that things are changing, and my life is changing, and the Lord has given us an opportunity for me to stay at home at least for a little while, I can't help but thinking, well, what if I'm no good at it? I have gone from college to graduate school (where I got a degree in "college") to working at a college-- I'm not sure I know much else. Folks have asked me if I will ever go back to work. Yes. Probably. Maybe. That's all I can say for now. I do have a dream of being a counselor. Getting another degree in social work or clinical psychology. Working with a church or a non-profit. Helping people whose lives are messy and whose pasts are painful. That is so where my heart is and where I think the Lord is leading me. But for now, He has me where Kyle and I both want me to be-- at home, with our growing family. Have you ever made this transition? From 9-5 to staying at home? How did you do it? How did you prepare? Any resources you could share? Am I making a big deal out of nothing? Father, help me to remember that I work for you. You have placed me where you want me, where I am needed. Please help me to use this time to serve and glorify you more and to bring our family nearer to you. You'll be great Laura! I looooved the transition and you'll soon have a baby as your wake up call so don't worry about that one! I have made the transition, and in my experience, most parts I love. Being able to raise my children and make a nice home. But I did struggle with some parts, like not having enough intellectual stimulation or adult interaction. All in all, I wouldn't change a thing. They grow so fast and I feel so blessed that I've been able to be here for it. You are a wonderful person and I know you are going to do great! !